More and more people are switching to non-dairy milks for a variety of reasons: health, taste, allergies and/or ethics. As a kid of the 80's, I was pummeled over the head with information about how "good" dairy milk was for you. Well, the jingles, advertisements and commercials didn't work; the truth is milk doesn't do a body good. Over the years I've tried soy, coconut, almond, hemp, oat, rice and probably more kinds that I can't even remember. And now, So Delicious has graciously sent me their newest beverages, So Delicious Unsweetened Cashew Milk and Unsweetened Vanilla Cashew Milk. If you know me, then you know all about my cashew obsession. I keep cashews in my car for a snack after work or the gym. So the idea of having a cashew milk is beyond exciting. Unsweetened is usually my favorite, so I tested it first. It has a nice nutty flavor that can be poured into cereal with no regrets. I imagine it would be a good choice for baking, also. The Unsweetened Vanilla has a little Vanilla flavor if you like to straight-up drink it. It would also be nice in coffee or milkshakes. Overall, I was very satisfied with both of the milks, with Unsweetened being my favorite. In fact, I'm eating it with my Panda Puffs as I type. Can't wait till I see the cashew milks in the stores! As So Delicious is one of the most awesome Vegan company out there, they have sent me two free product coupons to giveaway! All you have to do is put in the comments below your favorite So Delicious product and a way for me to contact you. I'll pick two winners at random! The giveaway ends Wednesday at 5pm CST. THEIR ICE CREAM!!! Totally rocks the world. (sdavissecord @ gmail dot com). this cashew milk also sounds really good too though! thanks for the review as always! How cool! I'd love to try their new cashew milks. My favorite So Delicious product is their cookie dough coconut milk ice cream! the ice cream is the best! I love ALL their products but the ice cream ROCKS!!!!!!!!!!!!!!!!!!!! We don't get that many "fun" products like this in our local stores, but I do enjoy the regular old almond milk and their mini ice cream sandwiches. If I see that Cashew Milk anywhere, I'll scoop it up! I would also like to try some of the ice cream. As a vegan, I miss it! My fave up to this very moment has been their classic vanilla soy-based "ice cream"...I'm crossing my fingers that they try a vanilla cashew-based dessert because that would totally spin my spurs! Thanks so much for the info on their new cashew milk! Cashew milk?! I need to find some ASAP!! I love So Delicious products! Right now my favorite is their Barista Style French Vanilla coffee creamer. Their ice cream rocks, too! The coconut milk-based ice creams are my favorite. This cashew milk looks awesome! Their ice cream is probably my favorite. I would choose a flavor but it is just too hard to pick one! My favourite is their coconut milk mint chip ice cream. So far I LOVE the Coconut Yogurt In Pina Colada. But the ice creams are so good, just don't get them very often because they are expensive! 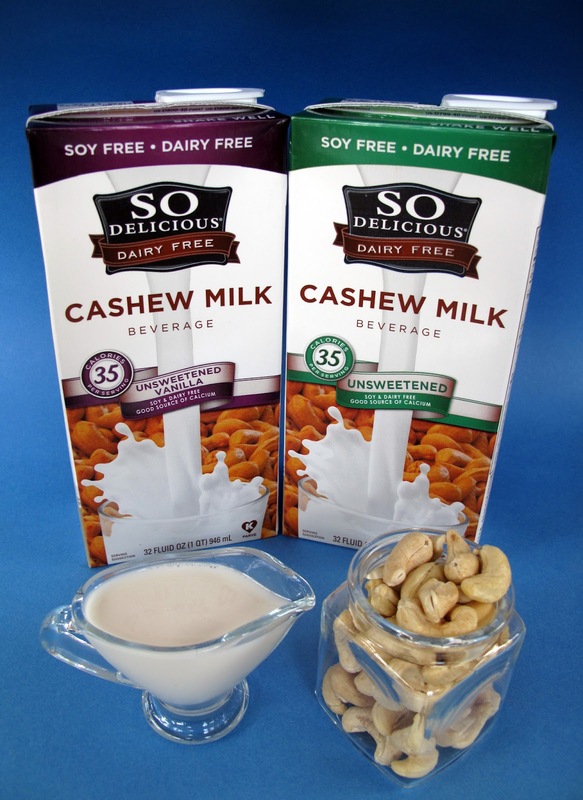 Can't wait to test the Cashew Milks! I LOVE Cashews too! Hmmm....I guess I'd have to say their ice cream if I have to oick just one! I adore the so delicious coconut yogurt! plain and blueberry flavor. i also love their ice cream - chocolate of course. email or face book works. i'm also on google plus. I wish Starbucks would offer nut milk! So Delicious Coconut Yogurt! Yummy yummy in my tummy! I love their coconut milk chocolate peanut butter ice cream. I love their almond milk coffee creamers. So so delicious! I love the butter pecan no sugar ice cream. Coconut milk because it doesn't curdle in my toddy coffee! So Delicious Ice Cream sandwiches are my favorite but their cashew milk sounds legit! The ice cream! My favorite is the peanut butter chocolate coconut milk ice cream, though the soy one is great too. I really like their cultured coconut milk yogurt! Any So Delicious ice cream is my fave product! So far I've only tried the mini icecream sandwiches and the single serve of chocolate coconut milk- super delicious. :) I want to try more products! email: jess (at) hippievision (dot) com. oh! i can't wait to try that! my favorite so delicious product is that so delicious cultured coconut yogurt, the vanilla especially! i can only keep a couple in the house or I would eat them all day every day! Mini ice cream sandwiches! Amazing! Even the omni friends love them (which is why I hide them). I LOVE So Delicious Coconut creamer--sooo yummy in coffee. Also great to use when making cashew cream cheese :D.
Another vote for ice cream! Thanks for all the entries! The winners will be notified. Made my own homemade cashew milk today. It’s WONDERFUL!! Everybody in the house loved it!